The city of Eureka announced this afternoon that police Capt. Steve Watson will take over as interim chief upon Andrew Mills' departure on Friday. Watson, born and raised in Fortuna, returned to Humboldt County in 2005 after serving in the U.S. Army, working as an elementary school teacher and serving as a deputy in Santa Cruz County. 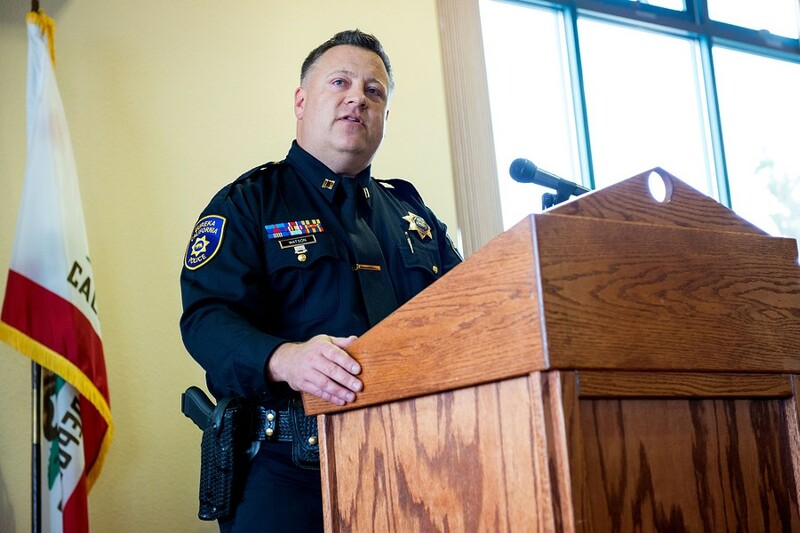 After joining EPD, he helped oversee the creation of the department's Problem Oriented Policing division and was often in headlines as the department struggled to address entrenched homeless encampments within his jurisdiction as a captain, the area of Eureka north of Seventh Street. Reached for comment on the appointment, Watson struck an upbeat and determined note. He said he will focus on moving forward with "what needs to be done, both inside and outside the department." Immediate goals include completing deescalation training for officers and improving retention of the current force, a majority of which is comprised of officers with less than five years in the department. Watson says he has seen a lot of "ups and downs" during his 12 year tenure with EPD, a time which included a string of officer-involved shootings, a departmental insurrection against a controversial former chief and prolonged budget woes. "The last four years under Mills have been very rapid paced with a lot of changes," said Watson. "He has also been a steady hand as a leader. I am obviously very pleased with his leadership but it's time to keep moving the department forward." Watson says he will also focus on expanding community partnerships and "changing the narrative" of how Eureka is perceived. He has a blueprint for what he wants to accomplish during his time as chief. "I am only interim chief but I want people to know they're not getting a 'Mills Lite,'" he added. "I am who I am. I’m going to make the decisions I need to make the changes I need to make." "I know that we’re not the perfect department," Watson said. "Work remains to be done. But we remain the finest law enforcement agency in Humboldt county. That’s not because of what we accomplished yesterday. Excellence needs to be nurtured.You can’t rest on your laurels. There remains a lot to be done." City Manager Greg Sparks could not be reached for comment this afternoon but the city's press release states that it will spend the interim period finding a permanent candidate for chief that will have the "desired background and experience, leadership style, skills and abilities that have previously been determined as necessary for the Chief of Police of Eureka." An outside firm will aid with recruitment. Watson's appointment comes as his department is facing increased pressure from business owners in Eureka's Old Town area on how to address issues with homeless people on West Third Street. Watson has been meeting with business owners and service providers in the area to discuss potential solutions. Effective July 21, Eureka Police Captain Steve Watson has been appointed as Interim Chief of the department. City Manager Greg Sparks noted that with the departure of Chief Andy Mills it is necessary to appoint an Interim Chief and to initiate a process for an open recruitment of candidates for theposition of Chief of Police. He further stated that the city is fortunate to have an outstanding department of uniformed and civilian staff with two effective and experienced police captains in Steve Watson and Brian Stephens. The goal during this interim period will be to continue moving the department forward and provide the critical law enforcement services that our community depends upon.